Make 2019 your best year ever with the latest tech – all in the new issue of T3 magazine! The new issue of T3 magazine is out now, and it has all the gadgets you need to make 2019 your best year ever. Our main feature is full of practical things you can do to feel great this year, from fitness gear that will make you healthier in a sustainable way, to home upgrades that’ll add real value to your house, to gadgets that can speed up your commute, to ways to sleep better, to… well, just some stuff that’s so cool, you’ll be happier with it in your life. And there’s tons more in the issue, of course, including the most beautiful TVs in the world (whether they're on or off), our look at the next generation of phones coming in 2019, as well as our tech travel guide full of essential gadgets and destinations. Plus, the budget smartwatch that's actually worth buying, Palm's 3.3-inch Android phone, the best sub-£500 soundbars, and even more! You can read a sample of the issue right in your browser below. Subscribe today and get a FREE stylish laptop bag worth £69.99! Get the issue FREE with a trial of our iPad/iPhone app edition! We're on Readly – get 3,000 magazines for £7.99 per month! We've also a special offer on currently – subscribe now and you'll get a free stylish and protective laptop bag (up to 15-inch) worth £69.99 thrown in! Find out more about the options here. Get the best outdoor tech for garden or holiday – in the new issue of T3 magazine! Tame the lawn without the effort, hike and camp smarter, zip around in personal electric vehicles, and loads more! Meet 2019’s Hot 100 tech list – in the new issue of T3 magazine! 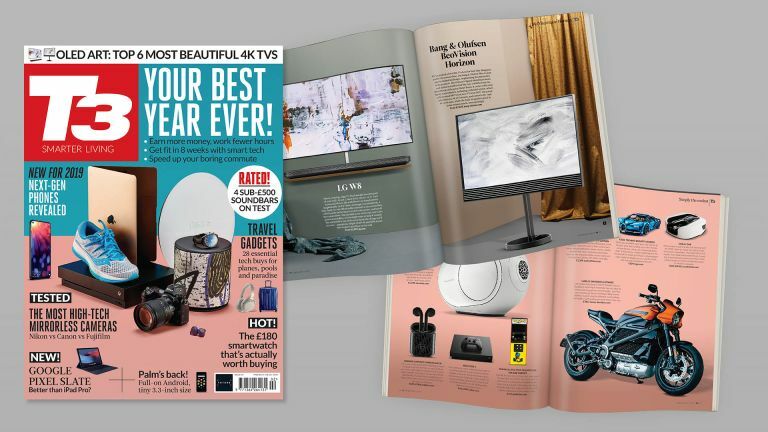 Meet your 2019 gadget wishlist – in the new issue of T3 magazine! Meet the ultimate smart home upgrades in the new issue of T3 magazine!